Every tango dancer is different, each one equally convinced of the truth of his perspective. 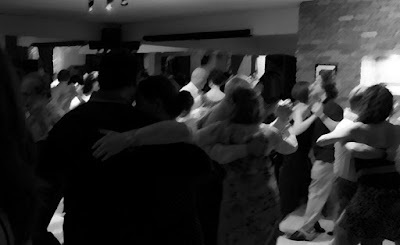 To mark my 20th year dancing tango, I have come up with 20 things I have learned in, through or about this dance, with all its complexities and contradictions. Here is my next "lesson." Lesson No. 6: The truth about tango is … elusive. The truth may be out there, but I have not yet found it, and you would have a hard time convincing me anyone else has. Seeking the truth is like seeking the perfect teaching method. Every teacher believes he or she has the best method, meanwhile most teachers' methods evolve over time, and I can tell you from experience, at each stage of that evolution we feel we have grasped a new, great truth. But a month, a year or 10 years later those truths have transformed yet again. Does that mean we were wrong last year and now we are finally right? We probably think so, but so does the teacher across town who has just discovered his own new truth. Some teachers are dead set against teaching any type of "basic step" or other pre-formatted sequence, while others don't believe in teaching technique, because they think students will develop good technique on their own through the repetition of movements and sequences. Is one approach better, or more "true" than the other? In reality, while one approach might be just right for one student, it could be all wrong for another. Different people learn differently and therefore, in the end, teachers need to include different approaches in their instruction, and students need to find the teachers who best fit their own learning style. While a visual learner might benefit most from watching the teachers demonstrate a movement several times, an auditory learner might prefer a detailed breakdown and explanation. Meanwhile a kinesthetic learner will be eager to try the steps him or herself, and will want to copy the teachers as they demonstrate rather than just watching. At the same time, detail-oriented types will pick things up differently than those who quickly see the big picture. Each will benefit from a somewhat different teaching approach, and will also probably hone their various skill sets (such as learning or remembering sequences, solid walking technique, the lead-follow connection, musicality and floorcraft) in a different order. There are teachers, dancers and even choreographers who don't believe in counting and only use musical cues, because they say counting makes your dancing too mechanical. Feel the music and your dancing will be musical. Makes sense. But then there are those who need to count everything. Learn to structure your dancing to the music and the "feeling" will come with time. Makes sense too. So is one way the right way? The best approach to both teaching and dancing will probably include a little of everything: some technique and some fun steps, taught using demonstrations and explanations, and learned through lots of practice time. But even then, the balance will shift over time and with each individual. And of course there are the divided camps when it comes to musical taste: "Everything played since 1955 is worthless!" versus "More than two Golden-Age tandas in a row is boring and repetitive!" I can tell you that both camps feel very strongly about their taste and each is pretty much convinced they are the ones who know the truth about tango music. Then I think of a dancer I know whose tastes I would generally consider very traditional (Fresedo-Ray, D'Agostino-Vargas, Laurenz, Maffia...). He knows his tango orchestras better than most, loves the Golden Age classics and rolls his eyes when something big and dramatic like Varela comes on – but then has no problem dancing to one of my totally alternative and out there tandas like Tom Waits. So whose musical taste is right? The overall tango experience itself is not the same for everyone. I could divide tango dancers into three main groups – social dancers, performers and perpetual students. Since tango was originally and remains primarily a social dance, social dancers are by far the predominant group. Within this group we find all sorts, but I will divide them into two groups. There are the gourmands – those for whom a successful night is one during which almost no tandas are sat out. These dancers are on the dance floor as much as possible, dancing with as many partners as possible, rarely sitting down to chat and almost never heading to the bar for a drink. This all-you-can-dance buffet type of dancer is often looked down on by the more discerning gourmet dancers. Members of this group always aim for quality over quantity. They dance to select tandas with select partners, are sticklers for the codigos and spend as much time mingling among themselves as actually dancing. They are often highly skilled and therefore pretty convinced they've got it right, but others accuse them of exclusion, snobbery and elitism. Whoever is right, they all forget that not every tango dancer is a social dancer. Some professional dancers spend so much time training, touring and performing that they rarely ever make an appearance at milongas. And if we are talking escenario (stage) dancers, there are plenty of social dancers who dismiss what they do as not "true" tango, because it is too choreographed, flashy or acrobatic. But those show dancers have skills well beyond what the rest of us can ever hope to achieve. So who among us is the true tango dancer? Speaking of dancers who don't go to milongas, I have students who have taken regular lessons for years (some of whom have become quite proficient along the way) but who never go out to dance socially. Perhaps their lifestyle (children, career, non-dancing life partner) doesn't lend itself to weekends and late nights spent in tango clubs, or perhaps the tango social scene just doesn't appeal to them even though they love the music and the learning process. Does that make them less of a tango dancer? The thing is, all these dancers are tango dancers, even if their skills, goals, vision and experience of tango are vastly different. The truth about tango, I guess, lies somewhere in the balance between simple fun and hard work, cool moves and strong technique, discipline and creativity, tradition and evolution. There may not be one great truth, but the quest will lead to many great discoveries. Previously: Lesson No. 5: But you do need to learn steps. Next: Lesson No. 7: You need a thick skin to dance tango. Interesting survey of these aspects. Matches my observations. For me the truth is simply the quest of pleasure while dancing. I fit in the category of "gourmands" and can derive pleasure dancing with the majority of partners no matter what their level is....as long as the music is good (melodic and rhythmically rich as opposed to sad and dull). There is as many tangos as partner combinations. That makes this dance so rich. Thanks Andrea. "As many tangos as partner combinations." I like it. Thank you, Sohel.